This article, the video and the podcast accompany the Women of Mathematics photo exhibition. You can download Julia Gog's exhibition poster by clicking here. To see more profiles of female mathematicians and to find out more about the exhibition, see here. Photographs by Henry Kenyon. Watch the interview with Julia Gog in this video! 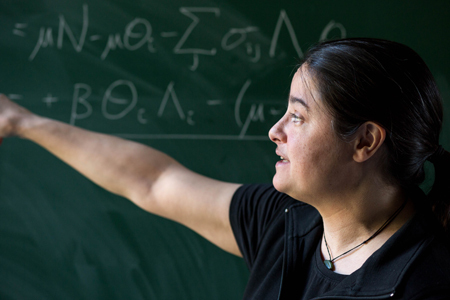 Julia Gog is a Reader in mathematical biology at the Department of Applied Maths and Theoretical Physics, University of Cambridge, and David N. Moore Fellow of Mathematics at Queens' College. Plus: How and when did you choose to do mathematics? Julia Gog: Did I choose? How and when? Well, I'm not sure there was a particular moment when I chose. In fact, for a long time, I wanted to do various other things as a child. As a young child, I actually wanted to be an archaeologist, and then I had a phase where I wanted to do civil engineering. It was actually during sixth form, when I got involved in the Mathematical Olympiad, and could see that mathematics was something far bigger, and that sucked me in. I chose then to do a maths degree. I can't remember when I chose to be a mathematician. I think it just happened. Have I still chosen? Have I grown up? Do I have a job yet? Plus: Did your friends and family encourage you? Julia Gog: Well, certainly, like probably most mathematicians, I had a crucial teacher in my sixth form, who very much encouraged me, and pushed me to aim a little higher, and think a little harder about things. < My family never pushed me particularly towards maths or indeed, academe at all. Actually, both my parents are wonderful people. They're nurses, and they always had the attitude that I was allowed to do absolutely anything, but there were two important things. One, it had to be something I wanted I to do, and two, I had to try and do good with my life. Those were the things. Julia Gog: Being a female mathematician? Well, I don't have many other points of reference here. I've never been a male mathematician or a female geologist, not sure. Maybe interesting though is last year, I went to one of the London Mathematical Society's women in maths conferences in Oxford, where the majority of researchers there were female. I thought that wouldn't make much difference to me, because I'm kind of used to this, and actually, it did. It felt really different, and then suddenly, it brought it into stark contrast. When I was back at other conferences, the women were in a minority. I was suddenly very aware of it. Yes, it's odd. We're in a minority, but we're quite a vocal minority, and it is changing. Plus: In what way was it different? Julia Gog: Just the dynamics. There were more people who I felt were like me, and it was easier to associate with other people quickly. The whole conference just had a whole festival feel about it. We were all clearly enjoying it. Julia Gog: The joys, the joys are many. I still love maths. I still love learning new maths. I still go and sit in on undergraduate courses on areas I think, "I don't know enough about this." I enjoy learning about maths, and the maths research, well, that's the real buzz, that's the massive buzz. I've only had a few real eureka moments in my research career, and they're fantastic, and I can picture them. You don't know they're those moments until afterwards, and you realise what's happened. Plus: Can you describe one of those mathematical moments? Julia Gog: Yes. Actually, the first one was during my PhD. I'd been working in this problem to try and make a system tractable [that is, manageable], and I was getting nowhere. I'd been doing this for weeks, months probably. Actually, I have to confess, I wasn't in the office at all, and I wasn't actually working. I was at home playing computer games. Suddenly, a system came into my head, I don't know where from, and I didn't think, "Ah, I have the answer. I'm done. I'm wonderful." I thought, "Why is this system not the right one?" I started with, "Is this wrong? Is there any reason why this one shouldn't work? Why is it not right? It can't be right. I can't have just thought of the right one." Then, investigating over a period of days subsequently, yes, it worked. Plus: Could you describe what your area of mathematics is about? Julia Gog: Yes. I do mathematics of infectious disease, so that's very applied maths in the sense that we're really focused on the applications and the outcomes. It's actually quite hard to pin down what area of maths it is. It's not just this type of differential equation or this type of statistics. We'll use whatever we get to hand. My PhD was fairly mathematical, and it was based on reducing a large system to something that was tractable, so that we can go and investigate some more particular things. Since then, I've been lucky enough to be able to work with some large data sets. I've had to learn data handling, and programming, and statistics, and I do a little bit of bioinformatics work, which means you use genetic data to design algorithms to find various things, and that suits me. I like this idea of moving around between different areas. Plus: Is there any advice that you'd give to a young woman wanting to become a mathematician? Julia Gog: A young woman wanting to become a mathematician? As distinct from a young person wanting to become a mathematician? Well, I guess everything I would say would apply to both groups, one being a subset of the other. The most important thing is to pursue areas and things that you enjoy and find interesting. Don't think about, "Is this a good tactical career move? Will this area lead to this or that?" No, follow your interests and they'll be the right ones. Read the books you enjoy, go to the lectures that you enjoy. Pursue a PhD in an area that sparks you, not the one that people tell you, "This area is the right one to go into." The one that makes you think, "Oh, yes. I want to go and do that." You'll instinctively know what that area is, and that would be the same for any young person. Thanks to the insights shared! Thanks for sharing the best insights by "Julia Gog", on Mathematics. Expert advice is always helpful in getting the right direction to achieve success. Mathematics is one of the tough subjects to be conquered at the school level, if one gets good conceptual knowledge of it, then he or she becomes a master of the topic and goes on to become a learned mathematician. Keep on sharing such inspiring posts and help us to know more about Mathematics. All the best!